Soft top boot, made of black cobra grain material, this boot slips over yout top when it is in the down position. Keeps your 1928-29 Roadster top from collecting dust and dirt when driving. Made in U.S.A. Keeps your 1930-31 Standard Roadster top from collecting dust and dirt when driving. Made in U.S.A. Keeps your 1930-31 Deluxe Roadster top from collecting dust and dirt when driving. Made in U.S.A. Keeps your 1928-31 Standard 4 door Phaeton top from collecting dust and dirt when driving. Made in U.S.A. Keeps your 1931 Deluxe 2 door Phaeton top from collecting dust and dirt when driving. Made in U.S.A.
Model A Ford Top Boot Storage Bag. Made in Black Vinyl Material. Use this mounting bolt, when mounting the roof frame irons to the Model A Roadster or Roadster pickup. 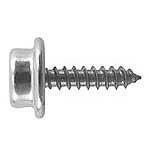 This coarse threaded carriage bolt goes through the A-42070 roof bracket, for the prop nut to screw on to. Made in USA. 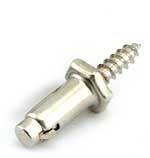 Use this stainless mounting bolt, when mounting the roof frame irons to the Model A Roadster or Roadster pickup. Special lock washer for the prop nut. Made in USA. These studs screw into the body on the 1928-29 Model A 4-door Phaeton and the roof frame irons attach to it. The prop nut is then screwed on to secure the frame. When the top is folded down, it pivots on this stud. These studs screw into the body on the 1930-31 Model A 4-door Phaeton and the roof frame irons attach to this. The prop nut is then screwed to this stud. 1928-29 Model A Roadster or Roadster pickup Roof Bracket. This bracket is mounted to the body behind the doors for the top to mount to. 1930-31 Model A Roadster or Roadster pickup Roof Bracket. Made just like Henry made the. These special prop knobs hold the open car top irons into the car. The standard design was 1 1/2" in diameter, and painted black. 7/6-14 thread. Made in USA. Roof Prop Knob for the 1930-31 Deluxe roadster and phaeton. These special prop knobs hold the open car top irons into the car. The deluxe cars has this polished stainless steel face with a steel back plate. 1 1/2" dia. 7/16-14 thread. Made in USA. Roof Prop Knob for the 1928-31 Model A Cabriolet. These special prop knobs hold the open car top irons into the car. The Cabriolet used a larger diameter. 1-7/8" knob with a polished stainless cover. 7/16-14 thread. Made in USA. Roof Prop Knob for the 1928-31 Model A sport coupe. The sport Coupes used this knob that has a stainless face, and a special thread size in the back plate. 3/8-24 thread. Made in USA. These studs are what screws into the body of the phaeton for the top saddles to mount to. Need 2 per car. Made in USA. 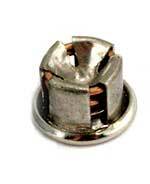 Top Saddle Stud for the 1930-31 4 Door phaeton. These studs are what screws into the body of the phaeton for the top saddles to mount to. Need 2 per car. Made in USA. Top Saddle Stud for the 1930-31 2 Door Phaeton. These studs are what screws into the body of the phaeton for the top saddles to mount to. Need 2 per car. Made in USA. 1928-31 Top Saddle. Powder coated black, this is what the 4-dr Phaeton top iron rests on when the top is folded down. This is the bare saddle. See the T-3876-P pad set below. Black leather pads with the matching straps. Protects and holds the top when in the down position. Used with 4-dr Phaeton top saddles. Made in USA. This split style 1/2" black vinyl welting was commonly used to finish off tops and interiors and has many applications. Originally used on 1928-29 Closed cab pickups, Panel Delivery, AA Panel Delivery, and on 1931 Special Delivery. Hidem Welting 10 foot roll. Hide'm Welt End Tip, Any Year. Used to finish off the hide'm welt. Nickel finish. SS nail included. Made in USA. Complete replacement roof kit for the 1928-31 Model A Ford standard 4 door phaeton, in black cobra short grain material, as originally fitted. This top quality, USA made open car roof kit included all the fabric parts needed to replace your old top. All parts are cut and stitched to fit the original type top iron and bow assembly. * main top deck, rear curtain, rear extensions or gypsy wings, bow covering, front wind breaker, rear apron (when required), straps, top fasteners, welting trim and complete instructions. * Top pads - must be ordered separately, below. 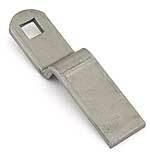 * Fasteners which affix to the body are available as fastener sets or as individual pieces. Rear window information: Roadster & Phaeton rear curtains do not have a window installed. You must use your old metal framed glass window or purchase a new one. The rear window must be installed during installation by you. NON RETURNABLE. IF YOU CANNOT INSTALL THIS KIT. GET AN UPHOLSTERY SPECIALIST TO DO IT. 1928-31 Phaeton black top roof pad set. Required, when ordering a phaeton top kit. Complete replacement roof kit for the 1928-31 Model A Ford standard 4 door phaeton, in tan canvas material. 1928-31 Phaeton tan top roof pad set. Complete replacement roof kit for the 1930-31 Model A Ford deluxe Roadster, in tan canvas material. Rear window information: Roadster & Phaeton rear curtains do not have a window installed. You must use your old metal framed glass window or purchase a new one. The rear window must be installed during installation by you. 1928-31 Roadster and Roadster pickup top roof pad set in Tan Canvas. Required, when ordering a top kit. 1928-31 Roadster and Roadster pickup top roof pad set in black. 1928-31 Stainless Open Car Rear Window Frame. The stainless steel rear window frame complete with glass and hardware. Note: Only stainless on outside. Frame is 7" x 16-1/2" on outside. Made in USA. 1928-31 Plain Steel Open Car Rear Window Frame. This is the rear window frame complete with glass and hardware. This is the set of small screws to secure the rear window frame together on the 1928-31 open car rear window frame. 1928-31 Window Support Bumper Set. These are the 4 bumpers that support the rear window of the Roadster when the top is down. They are exact duplicats of the originals with the screws that mount them. Top Clamping Bracket for the 1928-29 cars. The bracket on the front corners of the top irons that hold the top to the top of the windshield stanchions. If you are buying new top irons, these are already on them. Made in USA. Top Clamping Bracket for the 1930-31 cars. The bracket on the front corners of the top irons that hold the top to the top of the windshield stanchions. If you are buying new top irons, these are already on them. Made in USA. Top Clamping Screw 1928-29 Fine Thread. This chrome wing nut style screw holds the top irons onto the top of the windshield stanchion. Fine thread is 5/16-24. Top Clamping Screw 1930-36 Coarse Thread. 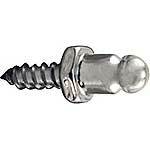 This chrome wingnut style screw holds the top irons onto the top of the windshield stanchion. Coarse thread is 5/16-18. These rivets are used to secure the wooden top bows to the top irons. Solid rivets were used on earlier vehicles, tubular on later. Setting tool for solid rivets in the top bows. (must be used with a standard air hammer). Tubular Rivet Tool 3/16". Used for setting tubular style rivets. Use for: door latches, windshield brackets, top irons, floorboard irons, shift plate clips and transmission fork pins. Made in USA. Top Iron Rivet 9/32 x 1". Made of stainless steel this rivet was used for holding the 30-1 Deluxe Roadster top iron assembly together. Made in USA. The two T bolts to hold the wood on the top irons for the 30-31 deluxe. All the hardware needed to attach wood bows to the top irons on the 30-1 Deluxe Roadster & Deluxe Phaeton. Order 2 sets for Deluxe Phaeton. Made in USA. When your top is folded down these straps attach to top and hook onto rumble grab handles to keep the top from bouncing. Used on Roadsters only. Black was originally used on 1928-29 Roadster & 1930-31 Std. Roadster. When your top is folded down these straps attach to top and hook onto rumble grab handles to keep the top from bouncing. Used on Roadsters only. Brown was originally used on 1930-31 Deluxe Roadster. 1928-31 side curtain body socket that goes in the body for the side curtains to snap in to. Six of these are used on a roadster and sixteen on a phaeton. 1928-31 Economy Body Socket. Cheaper version of the special socket that go in the body for the side curtains to snap in to. 1928-31 Body Socket Tool. This is the tool to install the special A-37101 sockets that go in the body for the side curtains to snap in to. Tack Rail for the 1930-31 Model A Roadster. Also known as the Belt Rail, this is the wood that goes around back of body, that the top attaches to. Tack Rail for the1928-29 model A Ford 4 door Phaeton. Tack Rail Fasteners for the 1928-32 Roadsters and 1928-29 Roadster Pickup. All of the special snaps and studs that screw into the back of the tack rail for attaching the top to the body. Tack Rail Fastener set for the 1930-31 Roadster Pickup. All of the special snaps and studs that screw into the back of the tack rail for attaching the top to the body. For the 1928-31 Sport Coupe and the 1928-31 Cabriolet. Attach the rear curtain and back of top to the body tack rail. Original style male snap fastner that goes in the top of the windshield. These are included in the A-37103 Kit. 6 are required. Nickel plated. Single 3/8" Lift-The-Dot Stud. Ten of these studs are normally mounted on phaeton and Roadster windshield stanchions to hold the side curtains on. 10/32 threads. The measurement given is overall length less the threads. Made in USA. Double (5/8") Lift-The-Dot Stud. Two of these studs are normally mounted at the top, on phaeton and Roadster windshield stanchions to hold the side curtains on. 10/32 threads. The measurement given is overall length less the threads. Made in USA. This set has the 12 male studs that screw into the windshield post for the side curtains, plus the snaps that go on the top of the windshield frame for the top to attach to. These are sometimes mounted on windshield stanchions instead of the threaded version, to hold the side curtains on. 1928-31 Female Lift-The-Dot Fastener . Commonly used on side curtains and tops. Comes with backup ring. Made in USA. Punches round hole and 4 slits in the perfect location for mounting the A-37103-F fastners in the material. 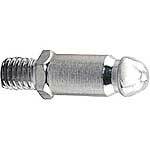 Single 3/16" Top Stud Fastener. Commonly used on the back of the body for the top to attach to. Size indicated is from top of hex to the retaining finger. Made in USA. 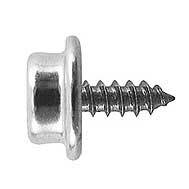 Double 3/8" Top Stud Fastener. Commonly used on the back of the body for the top to attach to. Size indicated is from top of hex to the retaining finger. Made in USA. Triple 1/2"Top Stud Fastener. Commonly used on the back of the body for the top to attach to. Size indicated is from top of hex to the retaining finger. Made in USA. Single Thickness Top Stud Fastener Eyelet. Female eyelet for A-37104 style fasteners. 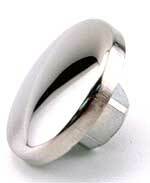 We also offer a double size one for thick or double layers of material. Nickel. Double Thickness Top Stud Fastener Eyelet. Female eyelet for A-37104 style fasteners. This is the the double one for thick or double layers of material. Nickel. (Single thickness shown). Side Curtain Fastener 1928-31. This is the male stud that is attached to the side curtains which locks into the A-37101 body sockets. 1926-31 prong style side curtain fastener. This is the male snap that attaches to the side curtain and snaps into the body sockets. This style fastens onto the curtains by bending 3 prongs over a backing ring. Side Curtain Stud Tool. This tool is needed to install the A-37105 & A-37104-F/FD fasteners. Made in USA. 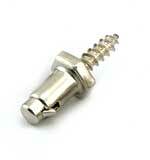 Slotted Head Durable Snap Stud 5/8" long thread. 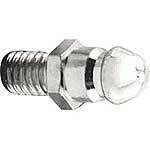 Slotted Head Durable Snap Stud 3/8" long thread. Phillips Head Durable Snap Stud 5/8" long thread. Phillips Head Durable Snap Stud 3/8" long thread. Stud has a 10/32 thread stud that is 3/8" long with phillips head. Snap Fastener Tool. A handy inexpensive tool for fastening snap style fasteners in material. Snap Fastener male Cap. You'll need the A-37106-T to assemble these. Made in USA. Snap Fastner Female Snap. You'll need the A-37106-T to assemble these. Made in USA. Snap Fastner Male Snap. You'll need the A-37106-T tool to assemble these. Nickel on brass. Made in USA. Snap Fastner Male Stud. You'll need the A-37106-T tool to assemble these. Nickel on brass. Made in USA. 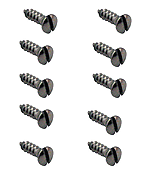 This is a set of 10 stainless steel sheet metal screws with slotted heads. 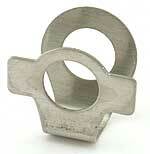 They are used for anchoring the male common sense fasteners on the Model T open car tops. 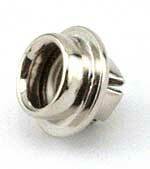 This chrome socket was used on the 30-1 Deluxe Tudor Phaeton where the curtain rod went into the body. Used on Deluxe Phaetons originally. Supported the top of the side curtain where rod stopped. Set of 2. Made in USA. Set of 2 Authentic style curtain rods for the 1928-29 Roadster. This is a set of 2 Authentic style curtain rods for the 1928-29 Model A Pick-up or Phaeton. (2 sets required for a phaeton). Set of 2 Authentic style curtain rods for the 1930-31 Standard Roadster. Made just like Henry made 'em. Authentic in every detail! Made in USA. Set of 2 Authentic style curtain rods for the 1930-31 Model A Deluxe Roadster. Set of 2 Authentic style curtain rods for the 1930-31 Model A Ford Deluxe Phaeton. Set of 2 Authentic style curtain rods for the 1930-31 standard 4 door phaeton. Made just like Henry made 'em. Authentic in every detail! Set of 2. Made in USA. Open Car Top Irons for the 1928-29 Standard Roadster. Complete set of top irons with the wood. Ready to install. Made in USA. Open Car Top Irons for the 1930-31 Standard Roadster. Complete set of top irons with the wood. Ready to install. Made in USA. Open Car Top Irons for the 1928-29 Roadster Pick-Up. Complete set of top irons with the wood. Ready to install. Made in USA. Open Car Top Irons for the 1930-31 Roadster Pick-Up. Complete set of top irons with the wood. Ready to install. Made in USA. Open Car Top Irons for the 1928-29 Standard Phaeton. Complete set of top irons with the wood. Ready to install. Made in USA. Open Car Top Irons for the 1930-31 Standard Phaeton. Complete set of top irons with the wood. Ready to install. Made in USA. 1928-29 Roadster Roof Wood Cross Bow Set. The Wood Cross Bows Only for the top irons. 1928-29 Phaeton Roof Wood Cross Bow Set. The Wood Cross Bows Only for the top irons. 1930-31 Standard Roadster Roof Wood Cross Bow Set. The Wood Cross Bows Only for the top irons. 1930-31 Phaeton Roof Wood Cross Bow Set. The Wood Cross Bows Only for the top irons. Top Wood kit for the 1930-31 Deluxe Roadster. These kits include the header above the windshield, and the steam bent bows that attach to the above iron kits. Made in USA. Top Wood kit for the 1930-31 Deluxe Phaeton. These kits include the header above the windshield, and the steam bent bows that attach to the above iron kits. Made in USA.